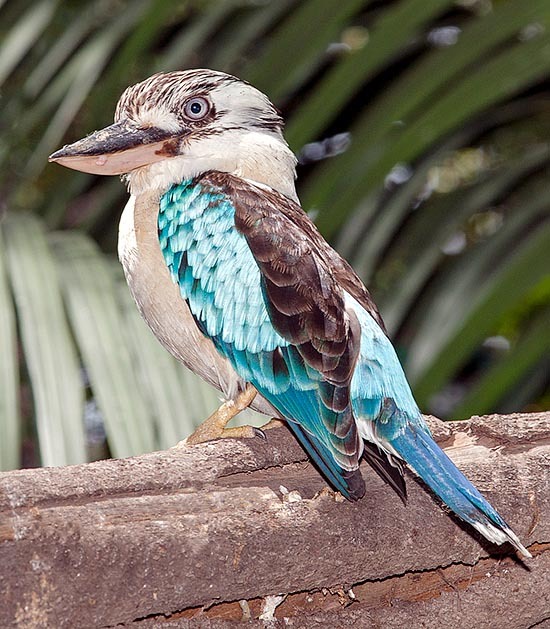 The Blue-winged kookaburra (Dacelo leachii Vigors and Hornsfield, 1827) belongs to the order of the Coraciiformes and to the family of the Alcedinidae, the same where have been placed several species of kingfishers. Quite similar ot its congener Laughing kookaburra (Dacelo novaeguineae) with whom shares good part of its range, it is one of the most known and most loved birds of Australia, their country of origin and belonging. The vulgar name comes from the old language of the local Aborigenes who did call it guuguubarra, onomatopoeic imitation of its strong and harsh call, name that has been reported by the first English settlers in kookaburra. It is not difficult to detect its presence wherever you are. Its terrifying call, in this species even shriller than that of the laughing kookaburra, is well audible from well afar and it itself signals it as soon as you get closer to its territory. This croaking is regularly emitted also during the day particularly at dawn and by the sunset, by single specimens as well as by whole families, causing such an uproar that cannot escape the even more careless and indifferent inhabitant. It has therefore become very popular like many of the strange animals living in this continent and unfailingly recognized by all. Moreover, it has acquired a remarkable sociality towards the man, so much to be also bred in captivity but even tolerated free around own’s home as if it were a domestic animal. It does not hesitate to approach the man to catch the food offered like if it was the hen house and not rarely, directly also from one’s hands. The fact that it shows such sociality towards the man does not mean that towards its similars it shows the same treatment. In fact, it is very territorial and does not bear the presence of intruders of whatever genus and kind, be they kookaburras of other families or even big predators. The etymology of the genus Dacelo is rather strange and shows what taxonomical fantasy or, better, what scientific careerism has led some scholars of the past centuries, to invent out of whole cloth nomenclatures that could carry their name in the future memories. Therefore there cannot be other possible definitions for this evaluation, keeping in mind that misspellings of this kind were a puerile way for creating neologisms used in the early Middle Ages. So the term “Dacelo”, absolutely without any intelligible meaning, is nothing else than the anagram of the Latin name Alcedo = kingfisher, as are also Lacedo and Cedola also names of genera of alcedinids birthed by this linguistic prank. The generic term honours the memory of W.E. Leach, English zoologist of the late XVIII century, to whom the authors Vigors and Hornsfield in 1827, did dedicate this bird. Other names given in the various languages are: in English, Blue-winged kookabura; in German, Haubenliest; in Spanish, Cucaburra aliazul: in Italian Kookaburra ali azzurre; in French, Martin-chasseur à ailes bleues and in Japanese a nice and for us unspeakable Aobanewaraikawasemi. This Kookaburra is known by some also with some vernacular names such as “barking jackass”, “howling jackass” or simply the Leach’s kookaburra. 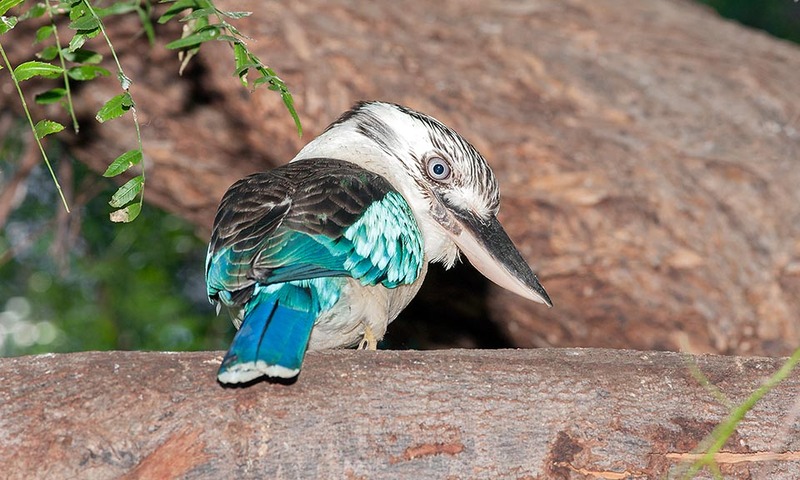 The blue-winged kookaburra lives in northern Australia and on the southern coasts of New Guinea. It occupies an ample belt of Western Australia, of Northern Territory and of Queensland that from the coast widens inside for a few hundred of kilometres without ever touching the central desert part of the continent. It is a sedentary species living constantly in its territory without ever abandoning it even after the nidification period. Very short movements do take place always inside its own range during occasional increments of the food availability in some locations. They are so much linked to their territory that even the young live up to maturity in the native places often helping the parents in the care of the follwing generations. Some subspecies have been identified among which four officially recognized that differ significantly for the accentuation of colour or of the particular occupied areas. It seems that the specimens living in more humid coastal zones have more lively colours. Dacelo leachii leachii, Dacelo leachii cervina, Dacelo leachii cliftoni, all continental species and Dacelo leachii intermedia, typical of New Guinea. We tend to think that the kingfishers are birds linked to the water, from which they get the food for their sustenance whilst the reality shows that various species of birds belonging to this group, have quite different behaviours and habitats. The kookaburras, generally, stand among these. They live indifferently in dry or humid places, primary and coastal forests, dense thickets or forests of eucalyptuses, cultivated areas or uninhabited savannahs, public parks and even inhabited sites. It is essential that in its territory there is enough food and the presence of big trees with hollows suitable for the nidification. Being a resident species it accepts and easily adapts to the seasonal variations of its habitat that may become extremely arid, during the tropical dry season or even flooded during the monsoon months. The first peculiarity that strikes while observing this bird, is the enormous size of the bill. A strong tool, robust and outsized for its dimensions, but at the same time nice for the prissy shape given by the slightly bent upward tip, particularity very appreciated by the human being that identifies this mark as a sympathy and cordiality index. The livery of this bird is characterized by the light blue of its wing coverts and of the feathers of the back, however visible at close range and when the sun reflects directly or when flying. With spread wings it shows also a big white alar spot that considerably contrasts with the blackish brown of the shoulders and of the remiges. The tail has a nice intense hazel colour that even more rejoices a livery that when perched may appear trivial. The body and the head are totally white or slightly dusted with brown grey. In some subspecies the tail is also light blue like the back, giving the impression when flying of and almost totally light blue bird whilst the head is delicately run by small greyish lines. Very short legs, insignificant, of yellowish white colour. The female is slightly bigger than the male and is about 40 cm long, weighs 350 and has a wingspan of more than 55 cm. The immatures have a paler and less defined colouration, with chest and head diffusely spotted of light brown. 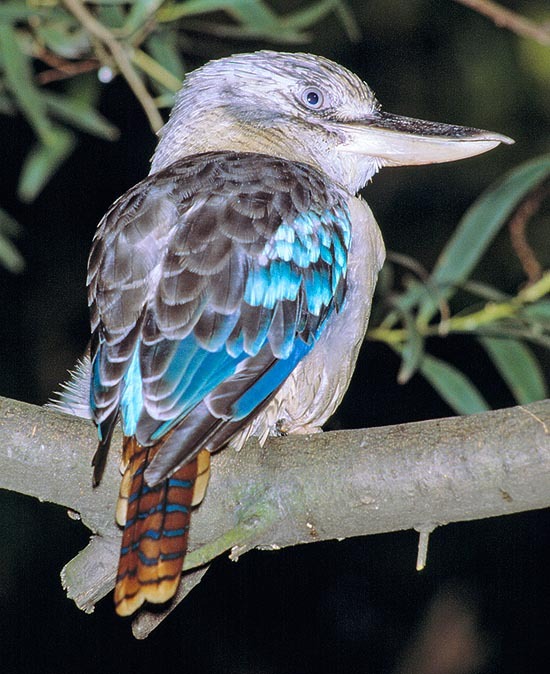 Despite being a kingfisher, or, better, a hunting kikngfisher, as French say, the kookaburra does not have nidifying habits typical of its congeners. Though provided of a mighty rostrum, it does not usually dig any hole or tunnel where to place its nest but chooses natural cavities in the trees where at times limits to widen the niche delving in the rotten wood the necessary room for placing the nest. A big hollow, ample and comfortable, seen that it will have to host for various weeks a good number of specimens. Any way, this species more than any other of its genus, occasionally excavates dens in termites mounds probably mistaking them with trees done with other material!! As an average, it lays two to three eggs bred indifferently by the whole team made by father, mother and outer helpers, usually sons of previous broods, that will care then the growth of the young even after their taking off. A real army useful for the common defence of the territory. The brooding lasts about 25 days but the chicks remain in the nest up to 7 weeks. The nidification site is easy to individuate as the soil at the base of the tree where it is placed, becomes soon a real latrine of excrements and wads regurgitated by the chicks. The sexual maturity and the consequent territoral dispersion, comes by the two years for the female and four for the males, and until that time they all remain linked to the native territory. 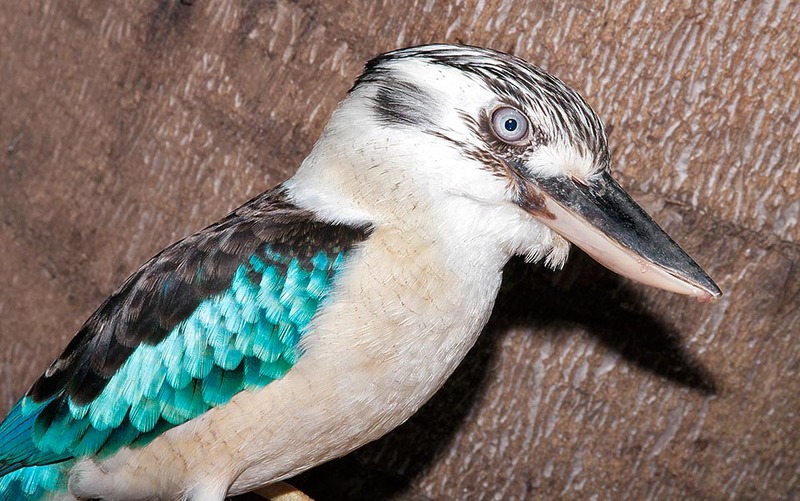 The blue-winged kookaburra eats lizards in great quantity integrating them with amphibians and small snakes, small rodents and small birds and big insects. It often predates others’ nests plundering the small nestlings. It usually swallows them whole but does not hesitate in dissecting them with the strong bill, in small pieces before gulping them down. The alive preys are usually killed slamming them violently to the ground, on stoned or on the usual supports. 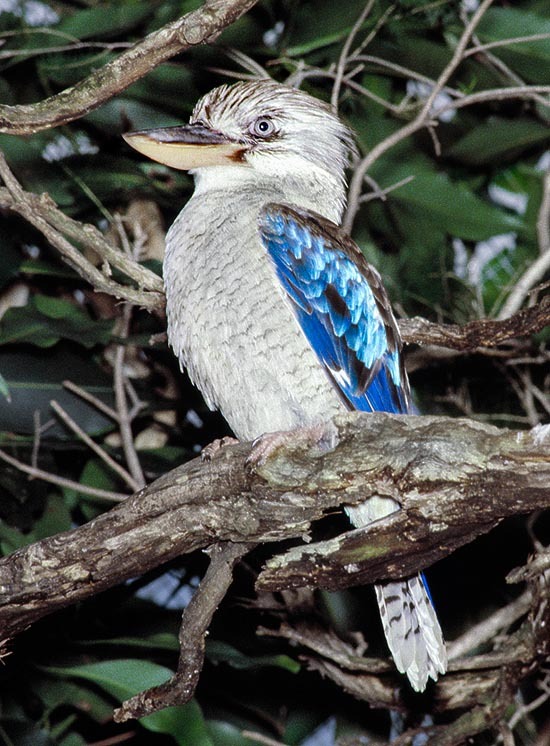 Considering the strong diffusion and the good consistency of the populations present in the occupied territory, the blue-winged kookaburra is not considered as an endangered species.